Herbert Lütje (30 January 1918 – 18 January 1967). He was a highly decorated night fighter pilot and flying ace during World War II fighting for the National Socialist (Nazi) German Government. A flying ace or fighter ace is a military aviator credited with shooting down five or more enemy aircraft during aerial combat. Lütje was credited with 50 aerial victories, 47 of which were claimed at night. Herbert Lütje joined the Luftwaffe in November 1937 as a Fahnenjunker (Officer Cadet). Lütje was transferred to the night fighter squadron of Lehrgeschwader 2 (LG 2—2nd Demonstration Wing) in December 1939. In February 1940 he was posted to the 12. Staffel (12th Squadron) of Jagdgeschwader 2 "Richthofen" (JG 2—2nd Fighter Wing). Flying with this squadron he participated in the Battle of France in May 1940 and flew numerous night fighter missions on single engined aircraft in June 1940. In July Lütje was transferred again this time to the Stab of III. Gruppe (3rd Group) of Nachtjagdgeschwader 1 (NJG 1—1st Night Fighter Wing). Flying his 49th night fighter mission he claimed his first nocturnal aerial victory on the night of 6 September 1941. With four aerial victories to his credit he was appointed Staffelkapitän (Squadron Leader) of the 8./NJG 1 (8th Squadron of the 1st Night Fighter Wing) on 1 May 1942. By the end of 1942 his number of aerial victories had increased to 15. Lütje claimed a B-17 Flying Fortress shot down during a day time mission against the United States Army Air Forces (USAAF) on 4 March 1943. He achieved his 20th aerial victory on the night of 29 March 1943. 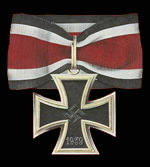 Lütje was awarded the Knight's Cross of the Iron Cross (Ritterkreuz des Eisernen Kreuzes) on 1 June 1943 after he had shot down six British bombers (aerial victories 23–28) on the night of 13 May 1943. Among them was a Royal Air Force (RAF) Avro Lancaster from No. 57 Squadron piloted by Pilot Officer Jan Bernand Marinus Haye on a mission to bomb the Škoda Works at Plzeň. The bomber was set on fire and the crew bailed out safely. He was appointed Gruppenkommandeur (Group Commander) of the IV. Gruppe (4th Group) of Nachtjagdgeschwader 6 (6th Night Fighter Wing). IV./NJG 6 was based in Rumania and tasked with the protection of the Romanian oil fields. In September 1943 he flew a number of combat missions out of the Netherlands claiming four aerial victories (aerial victories 29–32). Over Romania he again fought the USAAF during daytime sorties. Fighting the Fifteenth Air Force he shot down two P-38 Lightnings—one of them by his radio operator with the MG 81Z—on 10 June 1944. His Bf 110 G-4 (Werknummer 140018—factory number) was severely damaged. He and his wireless radio operator Oberfeldwebel (Sergeant) Bogumil were wounded and had to make a forced landing. Over Romania Lütje was credited with 6 Vickers Wellington bombers and one Soviet Ilyushin DB-3 reconnaissance aircraft over the Black Sea during nocturnal combat missions. At the end of August 1944 IV./NJG 6 was relocated back to Germany. Lütje was appointed Geschwaderkommodore (Wing Commander) of NJG 6 on 1 October 1944. 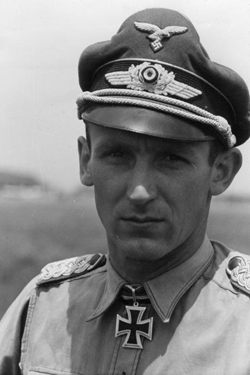 Lütje claimed his final eight aerial victories in 1945 and was awarded the 836th Knight's Cross of the Iron Cross with Oak Leaves (Ritterkreuz des Eisernen Kreuzes mit Eichenlaub) during World War II after 50 aerial victories on 17 April 1945. * Patzwall, Klaus D. and Scherzer, Veit (2001). Das Deutsche Kreuz 1941 - 1945 Geschichte und Inhaber Band II. Norderstedt, Germany: Verlag Klaus D. Patzwall. ISBN 3-931533-45-X. * Pitchfork, Graham (2003). Shot down and on the run: the RCAF and Commonwealth aircrews who got home from behind enemy lines, 1940-1945. Toronto : Dundurn Press Ltd. ISBN 1550024833. * Scherzer, Veit (2007). Die Ritterkreuzträger 1939–1945 Die Inhaber des Ritterkreuzes des Eisernen Kreuzes 1939 von Heer, Luftwaffe, Kriegsmarine, Waffen-SS, Volkssturm sowie mit Deutschland verbündeter Streitkräfte nach den Unterlagen des Bundesarchives (in German). Jena, Germany: Scherzers Miltaer-Verlag. ISBN 978-3-938845-17-2. * Scutts, Jerry (1998). German Night Fighter Aces of World War 2. Oxford, UK: Osprey Publishing. ISBN 1-85532-696-5. * Spick, Mike (1996). Luftwaffe Fighter Aces. New York: Ivy Books. ISBN 0-8041-1696-2.